On our Live Constructions show tomorrow night, we welcome a very promising band, The Westerlies. The Westerlies are a New York based brass quartet comprised of four friends from Seattle, Washington. 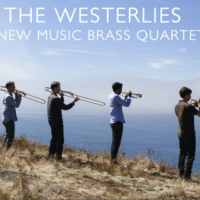 Avid explorers of cross-genre territory, The Westerlies are a collectively run ensemble dedicated to the cultivation of a new brass quartet repertoire that exists in the ever-narrowing gap between American folk music, jazz, classical, and indie rock. The Westerlies have premiered over 40 original works for brass quartet since their inception in 2011, and crafted an approach that Dave Douglas had described as “Swinging, grooving, clean and tricky playing. This is the group that, once you’ve heard them, you’ll realize they always needed to exist. Unique, original, exciting. And simply killing in the best sense.” The Westerlies music exudes the warmth of their longstanding friendships, and reflects the broad interests of its members. For more information, please visit www.westerliesmusic.com.